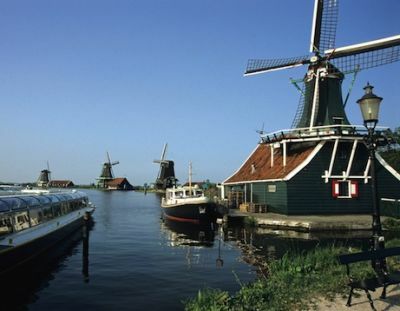 Windmills and waterways form the classic image of Holland, as the low-lying Kingdom of the Netherlands is often called. It specifically means two provinces, North and South, which are hollow land, including Schiphol Airport that lies 11 feet below sea-level, so the name is taken almost literally from the brine. 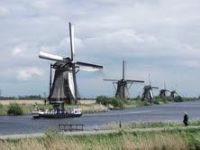 The doughty Dutch began reclaiming their land in the 13th century, using wind-powered technology that was eventually adapted for agricultural and industrial processing. By 1900, the 11 provinces had 10,000 wooden or brick windmills, most of which displaced water that is now pumped out electrically. Usually, a windmill’s cap swivelled horizontally to catch the wind, and the wooden machinery inside turned a massive vertical post connected with a paddle-wheel or Archimedes screw. As the sails turned, boosted by canvas and flaps during a breeze, water was drawn up from the marshes and thrown over a dike into the swift river. Several of the 1,173 survivors can be seen working, especially on National Windmill Day, and the best place is Kinderdijk, a former peat-bog 10 miles east of Rotterdam. The 19 windmills, dating from around 1439, still stand within a square mile that is now a World Heritage site. Holland’s highest pair rise 147 feet at Schiedam, nine miles south of The Hague, while the same distance northwards at Leiden stands De Valk, a flourmill become museum. The three smallest windmills are five-foot models at Madurodam where the Netherlands is laid out in miniature, close to the tramway between The Hague and the resort of Scheveningen. Mayor Jozias van Aartsen emphasised that half of the conurbation’s 9,049 rooms are in superior hotels, since this is the Dutch governmental centre plus insurance capital, with a seaside suburb, supranational courthouse and international school. I stayed at the 19-room Hotel La Ville, rated as 2-star but usefully enhanced. Suites have their own kitchen – guests may fry ham and eggs at the breakfast buffet – a discreet conference room seats 25. The hotel stands conveniently behind Nordeinde Palace, now occupied by King William-Alexander, an experienced pilot whose interests also include water management. The hotelier, Basil Barsoumian, explained, “My aim is to bring style and individuality back into travel". Tell that to Dutch railways (NS) that is taking years to renew track as well as stations like Rotterdam, besides replacing booking-offices with complicated chip-payments. Currently only two stations accept credit-cards: Amsterdam Central and Schiphol. There is, however, an excellent motorway network right from Europoort, to which P&O Ferries sails nightly from Hull. The best deal for a car with two passengers is £119 one way, and there are several other options on the Pride of Hull that is promoted as a luxurious liner despite being launched by the socialist Cherie Blair in 2002. The 5,925-grt ship’s facilities include a cinema and cabaret as well as a children’s playground and three shops. There are four bars, including the Sky Lounge, and three restaurants as well as a canteen for lorry-drivers. Freight provides 55% of revenue against 37% from a maximum 250 cars and 8% from foot passengers. All tickets are based on cabins that range from public four-berth to club suites. Captain Peter Holt, who hails from Southampton, told me: “Most of our 860 foot-passengers take our mini-cruise that allows one or two days anywhere between Amsterdam and Rotterdam. The £75+ includes coaches to and from their city-centres”. In one day, even without booking extra excursions, one can just about view the bulb fields (Keukenhof) and see Anne Frank’s house (Amsterdam) or visit art galleries in three neighbouring cities (The Hague, Amsterdam, Haarlem) or go round the Dutch parliament and Peace Palace (The Hague). 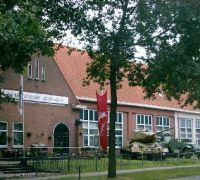 For visitors with more time, it is only 65 miles to Arnhem where the rural museum’s 75 buildings include a flourmill, sawmill and three drainage mills from various provinces. Another flourmill, named Concordia, can be visited in nearby Ede whose residents hid 3,000 Allied evaders in 1944.